To produce quality fruit, fruit trees such as apples, pears, cherries and plums need regular pruning in their first few years to develop healthy growth and well-spaced branches, and continuous minor pruning there-after. There are many different ways to prune fruit trees that result in good quality trees such as central leader, multi leader, open center, espalier and cordon styles, and we recommend that you research other methods if you are interested. This is an overview of central leader training, which results in an attractive fruit tree for ornamental home use. It is important to be willing to sacrifice maximum fruit production for the first few years in order to establish the proper form for your fruit tree. This will insure greater fruit production in future years. 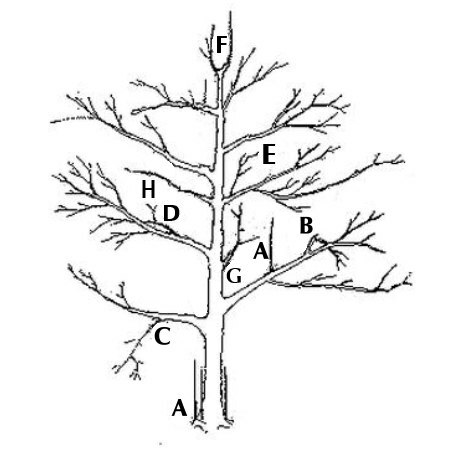 A tree pruned to central leader will have a somewhat Christmas-tree shape at maturity, with layers of the lower branches longer than the upper branches, and terminating in a single leader at the top. Each layer of branches should have 3 or 4 branches that radiate from the trunk fairly evenly, not directly across from or above one another. The next layer of branches should start 18 to 24 inches above the one below to allow for light to penetrate to the interior. The layers of branches alternating with open spaces continue up to the desired height of the tree. To create this shape requires careful pruning for the first several years. Pears - Trees are pruned similar to apples but tend to be more upright growing. Branch spreaders are a good method of developing wider crotch angles. Pears are slow to began fruiting and produce their fruits on spurs. Trees pruned heavily in winter respond in spring with many vigorous shoots called water sprouts, identifiable by their distinctly straight-up growth. These are undesirable and will need to be re-moved, causing a cycle of heavy pruning and vigorous re-growth. Heavy winter pruning can also lead to excessive vegetative growth that can reduce fruit development. Winter pruning should be restricted to light pruning and removal of diseased or broken branches. When winter pruning, prune as late in winter as possible to avoid winter damage. Apple and pecan trees should be pruned first, followed by cherry, peach, and plum trees. Summer pruning removes energy-producing portions of the tree and can reduce tree growth. Summer pruning should be limited to removing the upright and vigorous current season's growth using thinning cuts. Summer pruning can be started as soon as buds begin to grow, though it’s usually best to wait until new growth is several inches long. This is particularly true with young trees, which are more easily damaged by late cold snaps. To minimize the potential for winter injury, summer pruning should not be done after mid-August. On older trees where renovation is necessary, the major branch removal should be staggered over the course of two years. While it’s tempting to try to keep every fruit that sets on your tree, it is important to remove some for several reasons. First, it allows the remaining fruit to grow to optimum size and quality. Second, it increases the ability of the tree to form flower buds (and fruit) the following year. Third, allowing more fruit to develop than branches can support can lead to deformation or break-age of the branches, especially in younger fruit trees with still-flexible branches. Note that cherries do not need to be thinned. To thin, simply remove fruit when it’s approximately ½” in diameter, leaving one fruit every 6 to 10 inches. Cut rather than pull the fruit off, as you do not want to damage the fruit-producing spur.